Solar power business opportunities are growing thanks to a few things according to today’s guest, solar exec Eric Bakke: the realization that most of our energy resources are not unlimited or renewable, the health and environmental risks that come from relying on those resources and the government subsidies helping to expand our use of solar energy. This growth means more solar jobs and green careers for you. Below is Part 1 of the full interview with Erik Bakke of SMA Solar Technology. Erik explains that there are solar jobs all over America for new grads as well as career changers from sales careers like his to climbing on rooftops to install solar energy panels. Below, Erik gives an overview of solar energy, the solar business and shares sales advice. He suggests learning more from the Solar Living Institute and Solar Energy International (“SEI”). Solar jobs have received a ton of attention over the past few years, yet less than 1% of America’s energy comes from solar power systems. Around half of America’s energy comes from coal, about 1/4 comes from nuclear and about 1/4 comes from natural gas. Not only is solar energy (energy generated by sunlight) cleaner and safer for our health than our current energy sources, but it’s renewable energy: like Annie sang, the sun will come out tomorrow. Don’t miss our Green Career Resources (books and sites we recommend) or Part 2 of Learning the Solar Business & Sales where Erik talks more about the specifics of the roles to be filled in the solar business in general and commercial solar sales specifically. Careers Out There Host Marc Luber: Hi, Erik, how’s it going? Commercial Solar Sales Manager Erik Bakke: Great, Marc. Good to see you. Host Marc Luber: Good to see you. Thank you for joining us at Careers Out There. Commercial Solar Sales Manager Erik Bakke: Thanks for having me. Luber: So you have one of those green jobs. Everyone’s talking about green jobs. We’re hearing about it on the news, we’re hearing about it everywhere. You’ve got one. It’s gotta feel pretty good at this time when everything’s so focused on your path. Guest: You know, it is quite a fortunate position to be in, I have to admit. I have to be careful when I’m out at parties and things and talking to friends because a lot of people are struggling to keep their job or have lost their job and yet I have got more work than I could possibly imagine. So, it really is something I try to stay focused on without being too excited about it, but everybody loves to talk about the opportunities and things that are happening in solar. It’s great. Luber: That’s very nice. Tell us about what you do. Tell us what you do exactly. 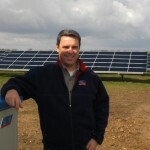 Guest: Well I’m a commercial sales manager for a major provider of PV inverter equipment. PV being photovoltaics for solar energy, and specifically electricity generated from the sun. I actually engage on a business-to-business level to sell our products into the North American PV market. Luber: Can you explain what an inverter is? Guest: I can. So a photovoltaic module is a big, flat panel that you see on the rooftop. They create direct current. So it’s just straight direct current, and it varies from the intensity of the sun, obviously, and so you need to convert that direct current that’s just like current you can get from a battery basically, a DC battery. You need to convert that into an alternating current to be used in the household. In North America, we have a 60Hz system, so we have to basically chop and create a sine wave out of a very flat DC power signal. So that sine wave has to be clean and smooth so that it meets the standards for power that your TV is expecting, so that it can be used in the household and also so that the energy can be placed on the power grid to be used by other households. Luber: So it’s totally separate from the actual solar panel that everyone is used to seeing on TV, right? Guest: It’s completely separate from the panel, although there are some newer technologies that are starting to bring the inverter piece, the electronics, to the modules, so the panels and modules might have something on the back of them. Eventually, I think you’ll be able to buy a square piece of blue silicon or black silicon that converts electricity with the inverter built into it. So we’re getting closer and closer to the appliance level. Luber: So if you’re selling the inverters, are you pairing up with people selling the panels? How does that work? How does it all come together? Guest: Well my customers are actually the companies that are creating systems for other businesses and in other cases for residential as well. I happen to focus on the larger systems, the larger inverters for the larger systems. So my customers are selling, designing and delivering a complete system to create AC electrical energy from the sun, and one part of that, a major part of that, is the inverter. Another major part is the modules. And then there’s wires and switches and monitoring systems, and so all of that together would be the ultimate solution. I’d like to think we’re the heart of the solution: the inverter. Guest: This is an interesting question because it’s a question we ask ourselves every day. We’re always analyzing who are the decision makers on the customer side, and it’s rapidly evolving and changing. The photovoltaic market, the solar energy market in the United States at this juncture, is just at the beginning. It’s very immature. Because of the recent admitting by most that there is a problem out there that needs to be solved in terms of greenhouse gases, and understanding or having the value explained to all, I think everybody understands the true economic value of solar energy now to shave the peak of high-priced electricity that we use every day. And then the federal subsidies, and state subsidies that have come along to make it truly economic so that it makes sense for people to invest. There’s been a huge boom recently and because of that, a lot of different players are rushing into the space. So our customer changes constantly. And as the sales manager, it’s my job to collect as much information about who’s in the market, who are the decision makers, how is that evolving, and I can tell you it’s evolving quite rapidly. So today we see our decision makers as the companies that actually do the design of the large systems. And it changes constantly who actually has the design. You may think that the one that’s announced in the newspaper on the press release, maybe it’s Sun Power or Sun Edison, typically they have sun somewhere in there in the name. They may be the ones that get the credit for it or have the best marketing for it, whereas the overall buyers, they a lot of times are leaving the decision on the specifics of the design to either their own in-house engineering team, which is becoming, well it varies across the board, or they’re hiring another company to do a turnkey solution for them. And so you have to read past the lines of the press release and understand who is actually doing the work there. Who is actually making the decision? And that’s really the challenge for sales for us. Luber: Interesting. So would you say that you’re kind of like a middle man then if and when you’re selling to those people? Guest: Well sometimes we are so far removed from the customer that there’s several steps before it gets to the decision to make a purchase of our equipment. And that’s troubling because sometimes that means they’re not making the right decision, in our opinion of course, for the overall value to the end-customer. And so that’s why we are also actively engaging with the end-users, the end-purchasers, who really are where the money starts. To help them to understand why they want to choose our equipment, or let’s say specify – in some cases we’re able to help them to specify our equipment because we have unique capabilities, benefits or features, or the overall economic value that it makes sense for them in the long run. But it’s a challenge every day to break through the layers. And to find, or let’s say convince the right evaluators to push the decision in the right way. Especially at the residential level and many times at the commercial level as well, the end customer is just buying solar energy. They have no idea what the components are, they don’t even know what an inverter is. So they may know something about modules, they’ve heard about this module or that…but the inverter? Even though that’s the most important piece? It really is the most important piece for the overall efficiency and economics of the solution. They really could not care any more or less whether it’s one brand or another, because they don’t know the difference. Luber: So there’s a lot of teaching that needs to be done from your side as a salesperson. Guest: Absolutely. Sales is really, to me, a consultation. Really, to me, if you’re not consulting the people that are making the decision who are evaluating or helping the decision maker to decide, then you’re not doing the right job. If you’re just going out and making a presentation to the purchasing manager, you’re probably talking to the wrong guy. The purchasing manager usually is the last one you want to meet with because they usually have the power to say no but they never have the power to say yes. It’s the guys that are going to use it, the guys that have the money, the purse strings, they’re the ones that are measured, let’s say, on their job, by the performance of the solution that they provide. So you have to show them how your solution will help them be winners and then they’ll tell the purchasing guy what to buy. Luber: The fact that you guys are a global company, I believe you’re based in Germany, is that right? Guest: Our headquarters are in Kassel, Germany. Right in the middle of Germany. Luber: So are things done that differently here than they are in the other places? Or are you guys able to learn a lot by how things are happening in the other offices so that you can say let’s apply what worked there over here. Or is it just so different? Guest: Both. It’s so different that it doesn’t apply in many cases. But it’s so different, they’re so far ahead of us as a country in terms of solar energy applications, especially on the large scale applications that I’m involved with today. There’s a lot to learn from them. There’s a huge amount of technology that could be applied here that would really help us drive the cost of solar energy down. So it is a wonderful place to be right now as an American, to work for a German company that’s had leadership in the market globally and continues. Over the last five years as the market just started to really bud and just started to blossom and now to be here at the very beginning of the US market. With that knowledge and that strength behind me really is helpful, one I’d say for me to learn quickly and two to bring solutions to my customers that will help them to learn quickly as well. Luber: It is fascinating how we really are at the beginning of this. Because when I was in 4th grade, and 4th grade was a long time ago, my 4th grade teacher, Mrs. Zwang, she had a solar house. And I remember her telling us we’re all going to have solar houses soon. This was in Chicago, this wasn’t Berkeley or anything. This was Chicago. And she said we’re all going to have solar houses soon and here we are, we’re still at the beginning of this. It’s pretty fascinating that that’s where we are, but it’s happening. Guest: A lot of people were worried at the beginning of this – the old timers – saying it could be another bubble. Because they saw this in the 70s as it came and went because, really, there’s a lot of politics. Government subsidies are really necessary to bridge the gap between our current reliance on fossil fuels, which is really a cheap, effective way to move energy around the world, but there are other implications today. Because they’re not being charged for those implications, there’s no value today on CO2 emissions. I think there will be at some point in the future, but there’s no value so the government has had to come along and, as they did in the 70s, say OK well we’re going to incentivize this to make it an even playing field, or to bring the value on par with what it should be so that it can be. And then as soon as they pulled that away, it just killed the value proposition. At this point, I’d say we’re politically beyond that point where somebody can come along and say there’s no value to green energy. I think we’ve gotten over that. But we’re really at the mercy of the policies of the government today to even the playing field. It could happen again. Luber: Yeah. I want to run with your saying. I want to get back to the topic of sales and what you were saying about the importance of it being a consultative process. But while you’re talking about this, I still want to run with this. According to my research, the solar world is a very small piece of our energy world. Coal, for electricity, from what I’ve read, is 49% of American’s energy supply, and about ¼ is nuclear and about ¼ is natural gas. What does this say to you? Are you inspired to be in this field for business reasons? For tree hugging reasons? What drives you with solar? Guest: That’s a great question, Marc, because I started in the nuclear industry. And then I graduated and decided that nuclear was a little bit slow and it had a lot of regulations and it didn’t feel like I was bringing true value to my customers. It was just pushing paperwork. And then I realized natural gas was the next big thing, it was the green solution and it made sense. I didn’t really think about it as green at the time, I just realized it was efficient and useful. So I got involved and was part of General Electric. I took off in that area and then I saw that we built, in the 80s and 90s we built a huge amount of natural gas power plants. I started reading a little bit about the fossil fuels, peak oil, the fact that we may not have a ton of natural gas, it’s going to become more and more expensive. And I realized that my bill for natural gas was going up in my home as well and I said I know why, because all these power plants I just built are going to be using a huge amount of natural gas. I realized that I wanted to do something for myself, personally, that would change one my cost of energy. Because I know where cost of energy is going, I’ve been part of that industry – and it will not go down. It will only go up in the future. And I realized that there are impacts on the environment that really matter, and I wanted to be a part of that solution as well. But I also saw a confluence of 3 things – the perfect storm kind of thing. Basically, the world politics. Everybody realized that we’re fighting for oil in foreign countries and it’s just not a good thing. It became obvious to me that people realized and started to get it – the impact on the environment, and that’s going to have some real impacts on us, personally, in this lifetime and certainly in our children’s life time. And that the costs of these wars and the costs of extracting fossil fuels – they are not going down, they’re going to continue to climb. All of that is, to me, the perfect storm that created the economics for me to get involved. I have to say, in my heart, I’m doing it for the right reasons. I’m in this for the right reasons, but I wouldn’t be here if I didn’t see a huge, huge opportunity economically for the country, and for the company and for myself personally. Luber: That’s great. If that answer doesn’t inspire someone in college right now to jump onto this path, I don’t know what would, so that’s good stuff. A lot of people don’t realize the health implications – you mentioned health and environment – of not going solar, there are some very serious national security and health implications. The clean coal thing doesn’t really exist yet, even though there’s talk about it. Guest: There’s no such thing. Just extracting the coal from the earth does so much damage. There’s no way on earth that you can call coal clean. There’s just no way. Luber: Yeah. A lot of people don’t realize that grandma’s got lung cancer because of what’s being shot out of those coal plants, and Junior has asthma for the same reason, and mommy’s fetus that’s in her is being poisoned by mercury from the fish that got into the fish because of the coal, and it’s just this whole big cycle. I don’t know that people really realize the serious implications – every time you turn on your light you’re putting more of that poison into the world and it’s affecting everybody. Guest: That’s right. Absolutely. Unfortunately, it’s relatively inexpensive, so the economics are strong. Luber: And that’s where the incentives you were speaking about earlier, saying helping to make it a more level playing field, that’s where those come in and why they’re important. Right? Luber: OK, I want to go back to when you were talking about sales and how it’s a consultative process, it’s not shoving anything down anyone’s throat, it’s not meeting with the wrong person and getting in their face. I was in sales for years, either in technology or as a recruiter. Recruiting is a 2-way sales process. People often don’t understand sales. And it is a listening process and a consulting process. You’re there to help the other person, isn’t that right? Guest: Totally. Absolutely right. If you don’t learn right from the beginning, that you need to shut up and listen, ask open-ended questions, get people talking, encourage them to tell you more about their issues, their problems, and what’s exciting, what they’re measured on, who is in their organization. You need to learn so many things about, especially in business-to-business sales, you need to learn so many things about the decision-making process in that organization before you can even begin to have a strategy or a tactic that will make any sense to get you the order. Otherwise, you’re just getting lucky if you’re making sales. You really are, just getting lucky otherwise. You need to find ways to help that individual who is either evaluating your product and will consult the decision maker within their organization or you need to get to the decision maker to help them decide quickly that you are the right choice. And that there’s a win in it for them not only as an organization but usually you have to find out what it is personally for that individual or group of individuals. What is it that will propel them in there – either their own self esteem or their personal goals – within that organization will help them to rise or gain stature. So it really is about so much more than just the great features that your product has and slapping them up on a power point and showing oh, this is why, these are all the great things, and these are the bad things that my competitor does. That’s a start, and you know, you need to have some of that, but you should have that in a flier that you could leave behind. You should spend more time listening, understanding to what’s important to that particular individual and his boss. Luber: Very good advice. I think that’s painted a good picture now. We’ve painted the picture of what is solar, why it’s important, why it’s exciting for you, and sales as well, so that brings the 2 together to your career path right now. That will be continued in Part 2.